Discussion in 'Oven Cooking' started by Jlatha, Jan 30, 2017. Cook the mungdal to a paste like consistency . In a big bowl add rice flour, mungdal paste, turmeric, salt, chili powder, carom seeds or cumin seeds. Mix lightly. Heat oil and add the sizzling hot oil to the rice flour mix. Add water as needed to make a stiff dough. Knead thoroughly with hand not food processor. Take a lemon size dough and place it in a chakli mould or icing bag with star nozzle. Heat oil for frying. Test the oil by dropping a small piece of dough and wait for 3 seconds if it does not rise to the top then oil needs to be heated. 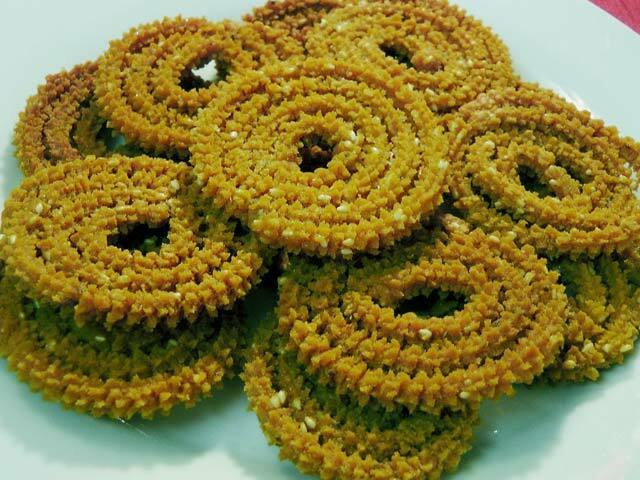 Gently make a spiral with the chakli mould or icing bag and deep fry to a golden brown. Cool moong dal chakli completely before storing in an airtight container.